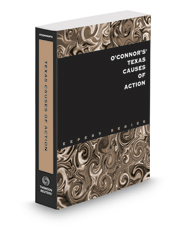 Home > Law Books > Practice Materials > O'Connor's Texas Causes of Action, 2019 ed. O'Connor's Texas Causes of Action is the go-to resource for Texas attorneys that provides indispensable information on the causes of action most frequently filed in Texas. You'll find coverage of elements, remedies (including damages, interests, court costs, and attorney fees), defenses, limitations periods, and related causes of action. Causes of action are presented in alphabetical order, from Abuse of Process to Wrongful Discharge, and everything in between.